They're all here... for you! This Five Nights at Freddy's 2-Inch Vinyl Figure Set 2 features Freddy, Bonnie, Springtrap, and Balloon Boy! This set comes packaged in a windowed display box and each vinyl figure stands 2-inches tall. They're all here... for you! 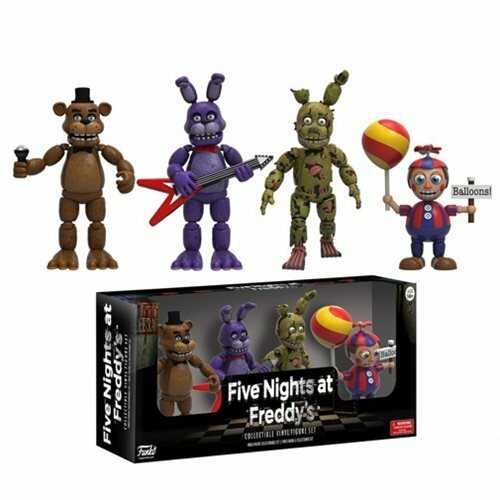 This Five Nights at Freddy's 2-Inch Vinyl FigureSet 2 features Freddy, Bonnie, Springtrap, and Balloon Boy! This set comespackaged in a windowed display box and each vinyl figure stands 2-inches tall.